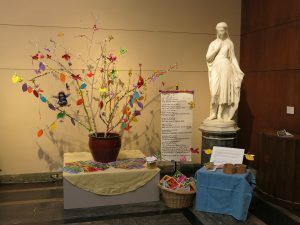 The Tree of Hope is an interactive art project. It engages the viewer in thinking about what gives her or him hope in the face of climate change, and to see what gives other people hope. The tree was originally conceived for the “Harvest of Hope Festival “ at the Pittsfield Commons in October 2016. This festival was a celebration of diversity and community spirit created by the grassroots organization Manos Unidas/Hands Helping Hands Multicultural Educational Cooperative and developed by multiple community partners. Living the Change decided to ‘harvest hope” on the leaves of the tree. We brought tree branches wrapped with colorful tissue paper along with paper leaves. The public then was invited to write on the leaves what gives them hope in the face of climate change. It was a moving experience to talk with people about what they wrote. By the end of the day we had a tree full of leaves and hope. Living the Change then expanded the project, placing the branches in several libraries in the county. (Mason Library and Simon’s Rock library in Great Barrington, the Lee Public library and the Berkshire Atheneum in Pittsfield.) For two weeks, many more people participated by writing on the leaves. 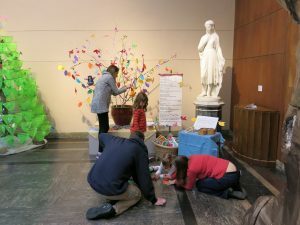 Some of the libraries created an exhibit of climate change books around the tree. In 2017 the Tree of Hope traveled to three different events. On January 7 Living the Change joined the 4 Freedoms Coalition for a Rally in downtown Pittsfield, to recommit to upholding the true American values embodied in the Four Freedoms and to oppose bigotry and prejudice. 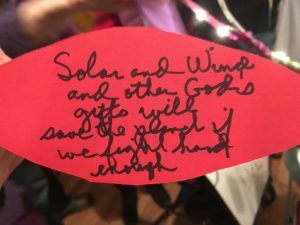 The Tree was displayed at the Living the Change table and we were happy that so many wonderful things were written on leaves by the good people who came to the event. 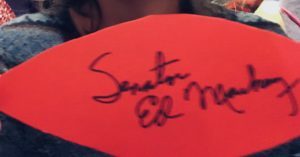 Senator Edward Markey, who spoke at the event, also wrote on a leaf! 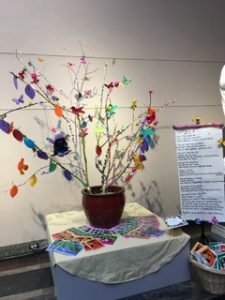 On May 13 the Tree was displayed at our second Climate Fair, at the Stationary Factory in Dalton, MA, where it again gained many meaningful leaves from yet a different public. In December the Tree of Hope morphed into the Tree of All Life. It took its place for the second time among the many Trees at the Festival of Trees at the Berkshire Museum. 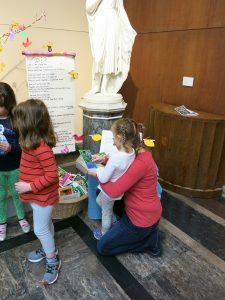 Accompanied by a poem describing the interconnectedness of all life, the Tree was filled with butterflies, bees and birds. A doll on a swing represented humanity. 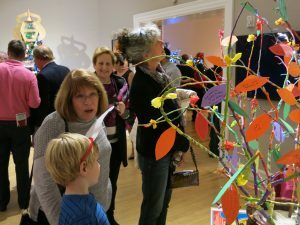 The public was again invited to write a reaction to the Tree on a leaf and attach it to a branch. 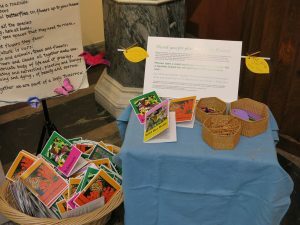 In addition, Living the Change provided free hand-harvested packages of native flower seed for people to take with them and sow in their gardens or in the wild. Native flowers support local wildlife, especially pollinators such as native bees, birds and butterflies which are under stress from climate disruption, habitat loss, etc. The flower seeds came with colorful cards with information about each flower, which you can view below. We were happy to find in the end that many children had drawn and written on the leaves. From scribbles to names, to sweet little notes such as “Bear pups” and “I love trees”, they left their signs of having been there, and we hope they were inspired to know that they too are part of nature, and will help it thrive through planting seeds in the spring. Our only regret was that we did not provide more seed packages. In just 10 days all 550 seed packages were gone. May those seeds germinate and the plants proliferate in nature’s abundant way! Stay posted on what the next phase of this project will be. If you or your organization/institution are interested in hosting the tree, please contact us. where everything’s needed for all to thrive. they all work together, so you are alive. because the birds went in search of more nourishing grounds. and plant flowers they favor. and rivers and clouds all together make one. of living and dying, of beauty and sorrow. Together we are part of a lively tomorrow.